This black 3XLarge LensPouch from LensCoat is a soft neoprene bag designed to hold and protect lenses or other accessories during travel or storage. The padded construction protects the body of the lens against bumps, scratches, or accidental impacts and a removable reinforced front element disc offers firm protection to the front of your lens. 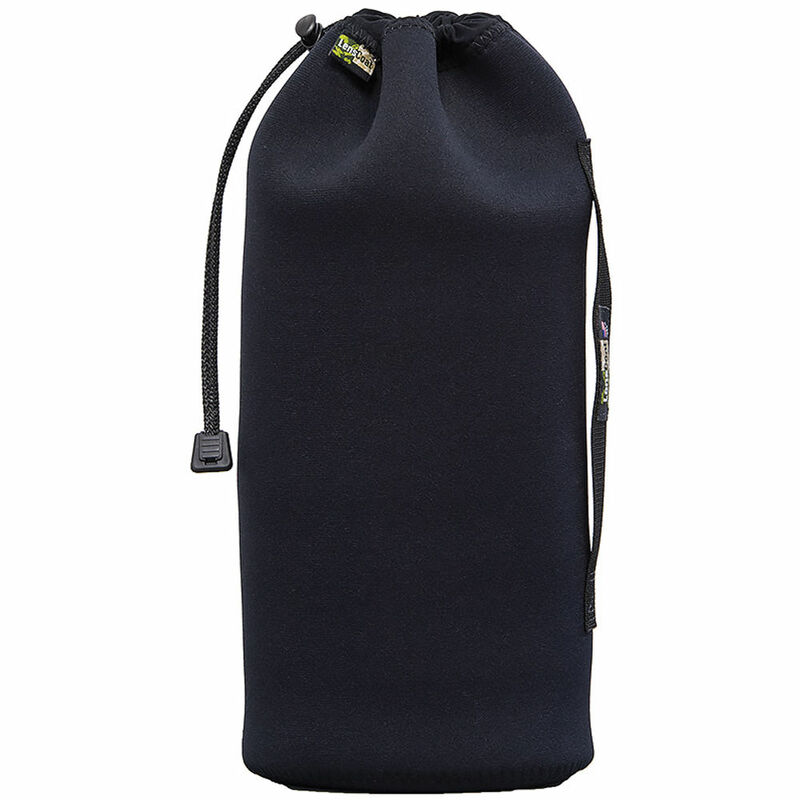 The pouch is secured using a top pull-cord, which provides quick and easy access to the interior contents; an integrated side handle can be used for carrying or attaching to another bag or strap; and the pouch's design folds flat for storing when empty. This pouch measures 6" in diameter and is 13" tall. An additional 0.75" to 1" should be added to the actual length of the lens or items in order to ensure a proper fit within the pouch. Box Dimensions (LxWxH) 13.0 x 7.9 x 1.9"
LensPouch (3XLarge, Black) is rated 4.7 out of 5 by 7. Rated 5 out of 5 by Daniel from Better than the Nikon Pouch I purchased this to house my Nikon 200-500 f5.6. This is my third LensPouch and will not be my last. The 3XL pouch fits the Nikon 200-500 fairly well and affords more protection than the flimsy Nikon pouch the lens shipped with. Rated 5 out of 5 by JDA-Wildlife from Great for Tamron 150-600mm Lens Purchased this pouch for my Tamron 150-600mm lens. I could have gone with 1 size smaller but glad I purchased this size. Rated 5 out of 5 by Edward from Nikon 200 - 500mm 5.6 This size easily fits the Nikon 200-500 5.6 with the lenses lens screen attached and actually has some extra height to spare. Very nice for protection if you just want to throw the lens in a bag and not take up any additional space. Neoprene is a little thin but there is a lot of extra protection on the bottom, so no worries there. Rated 3 out of 5 by Bart from I Can not recommend this This was a last minute purchase as I was checking out. The Sigma lens I bought included a much nicer case as compared to this pouch. It provides no padding so I would never trust putting any of my lenses in it. Rated 5 out of 5 by Manuel from Love the feel of the neoprene I don't use it for a DSRL lens, but as a bag to protect the Sony FS7 handle inside my Pelican case. Plenty of room and looks like it will do the job. Rated 5 out of 5 by JDA-Wildlife from Perfect for Tamron 150-600mm lens Well made Pouch. Great fit for my Tamron 150-600mm Lens.